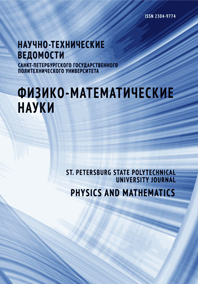 Makhnov Andrey V. Smirnov Evgeny M. Schmidt Alexander A. Isaenko Iliya I.
Cavitation is a process of vapour and gas bubbles formation in a liquid flow. It occurs when a flow pressure drops below a certain level depending on liquid’s physical properties and its temperature. One of the important factors of cavitation is the presence of unsolved microscopic bubbles filled with gas and/or vapour in real liquids. These bubbles, or nucleation sites, evolve under pressure drops that are sufficient for evaporation of surrounding liquid. A model of cavitating flows based on Euler – Lagrange description of multiphase medium has been developed. It took into account heterogeneous nature of cavitation bubbles formation. The Rayleigh – Plesset equation along with interphase mass and energy transfer equations were used to simulate bubbles evolution. The developed model provides qualitatively accurate prediction of cavity shape and its borders position in comparison with the experimental data.